I was going through movies on Amazon when I stumbled on The Monster Project. Since I love indie horror, I had to give it a watch. I'm happy I did. The Monster Project was directed and co-written by Victor Mathieu with Shariya Lynn and Corbin Billings. 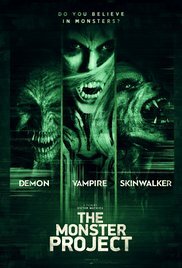 I loved the whole premise of the movie: Indie filmmaker Devon (played by Justin Bruening) sees that people are willing to believe anything online with regards to the supernatural, so decides to cash in on this and do a documentary about "real" monsters. With his sidekick, Jamal (played by Jamal Quezaire), manning the camera and tasked to come up with a name, The Monster Project is born. An ad on Craigs List goes up calling all real life monsters to come out to tell their story, and the fun begins. Also in the movie we have Bryan (played by Toby Hemingway), a recovering drug addict looking to change his life though his new found faith, and Murielle (played by Murielle Zuker), an aspiring director and Devon's ex-girlfriend. The monsters answering the call are Yvonne Zima as Shayla the vampire, Steven Flores as Steven the skinwalker, and Shiori Ideta as Shiori, the demon girl, who just happens to be legitimate. Add one old, filthy, scary house, and you've got yourself a train wreck in the making.